(Nanowerk Spotlight) Glues adhere to solid materials via a multitude of fundamental physical or chemical interactions. Either chemical reaction times or solvent evaporation rates determine the point in time, when this interaction sets in and fixes the object to be glued. One form of glue is based on electric adhesion, for instance when electrostatic fields are used to attract dye particles to surfaces. In nature, mollusks use surface charges to hybridize mineral particles and proteins to give their shells their unique mechanical and optical properties, but in a rather static manner. Another example is when electric potential changes are used to either attract or avert DNA at conducting surfaces in biosensor applications. "Electric potential has been used to attract polymers continuously to an electrode surface and to toggle molecules between states for a molecular switch," Hermann E. Gaub, a professor of physics and head of the Biophysics and Molecular Materials Group in the Physics Department at the Ludwig-Maximilians-University (LMU) of Munich, tells Nanowerk. "If you wanted to create electric glue, you would need to be able to control the interaction of a polymer and an electrode surface reversibly, thus creating a nanoscale system with electrochemically controlled adhesion." In a paper in the April 26, 2011 online edition of Nano Letters ("Electric Glue: Electrically Controlled Polymer-Surface Adhesion"), first-authored by Ann Fornof, a postdoc researcher in Gaub's group, the team describes how Coulomb forces between polymers and surfaces may be measured, controlled, and manipulated. "Since Coulomb forces can be controlled by an applied electrical potential between the glue and the surface, this interaction can be easily controlled externally," explains Gaub. "Electric glue is the consequent implementation of these ideas. An electric glue can be switched on and off by voltage and reaction times – depending on the geometry – may be very fast. For example, objects to be glued may be aligned carefully and only when optimum alignment is reached, the voltage is switched to hold." He adds that bonding by electric glue may be designed to be reversible: an applied voltage may be such that the bond is weakened and the parts may be separated. The adhesion is tuned by the addition of backbone charge to the polymer such that the polymer end group reacts with the surface or not based on the direction of applied potential. To explore the 'electronic glue' concept, the LMU team utilized a custom atomic force microscope (AFM) setup with a gold working electrode as the surface of interest. In a series of experiments, three polymers with differently charged backbones and primary amine end groups were utilized to control adhesion based on the electric potential of the surface, as well as to probe the influence of backbone charge on this process. "In each experiment, we explored a different backbone charge on the polymer by using an AFM tip functionalized with a different polymer" explains Gaub. "We were able to demonstrate electrochemical control not only for biopolymers but also for commercially available and synthetic polymers." The team found that the bonding of polymers to the electrode is dictated by several factors. 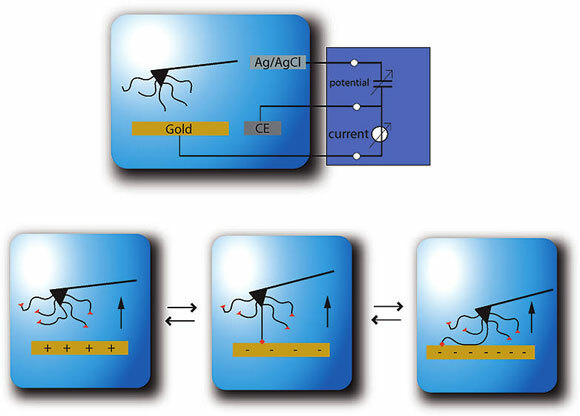 One factor appears to be the noncovalent influence of backbone charge, while another factor controlling electric glue behavior is the oxidation state of the gold electrode itself. The researchers point out that the polymers also provide an ultrasensitive indicator of the electrochemistry occurring at the electrode surface. To develop this 'electronic glue' concept further, several challenges need to be overcome: how to increase polymer density and bridging of the polymers between the two surfaces to be glued; how to improve holding forces; and how to increase hysteresis between high and low force.